What Are The Best Online Graduate Certificate in Accounting Programs? What Will I Learn in an Online Graduate Certificate in Accounting Program? The field of accounting touches all aspects of business and management. According to the National Association of Colleges and Employers, accounting salaries exceeded the average salaries for positions in business in 2015. There has never been a better time to explore the professional possibilities afforded by an online graduate accounting certificate. Requiring less than a year to complete, graduate certificate accounting online programs provide an advanced, focused background in accounting without the long-term commitment of a degree. The online format allows students the flexibility to quickly apply learned skills to their career goals. Below, we'll discuss the educational and professional opportunities available to graduate certificate accounting online students. Although Harvard is located in Cambridge, Massachusetts, its online graduate accounting certificate makes the university accessible from anywhere. To earn the certificate, students enroll in four courses that typically take a year and a half to complete. The course requirements consist of one core course and three electives. Students in the program learn about accounting principles such as cost systems, cost behavior, budgeting, variance analysis, and cost estimating. A grade of "B" or higher in each course is required in order to earn the certificate. There is no formal application process. Instead, students are welcome to register for courses in the fall, spring, or summer semesters. Tuition is charged at a flat, per-semester rate. Credits from the certificate in accounting can count be applied to a bachelor's or master's degree in either finance or management. UConn offers a flexible online graduate accounting certificate that can be completed on your own schedule. The program is designed to last two semesters, though the university allows classes to be taken for up to four semesters. The courses cover subjects such as financial reporting, assurance services, and federal income tax. Most courses are delivered asynchronously, but the program does have synchronous components such as timed three-hour exams. Students with undergraduate degrees in any field are welcome to complete the certificate program, but those who did not major in accounting will need to complete two introductory accounting courses that the university does not offer online. As part of the application, prospective students must submit answers to four short essay questions. The program begins only in the fall term, so applications are due June 1 of every year. Tuition for this online accounting graduate certificate is charged on a per-class basis. Auburn offers an 18-credit hour online graduate accounting certificate for professionals who want to take classes required for the CPA exam and certification. The certificate can be completed in three semesters. Students who work full-time are not allowed to take more than two courses per semester. Six courses are required to earn the certificate. There are a total of 13 classes to choose from, but selections must be approved by the student's advisor. Applicants are evaluated holistically, so there is no minimum GPA requirement. GMAT scores are not required for admission. Overall academic achievement, accounting background, and work experience are considered together in making admissions decisions. A number of undergraduate accounting and business prerequisites such as micro- and macroeconomics are required. Tuition is a flat per-credit rate that applies to both in-state and out-of-state students. USF is located in Joliet, Illinois, but its online graduate accounting certificate gives students all over the country access to a quality education. The program consists of four courses that total 12 semester hours. Students learn about international accounting and reporting standards, relevant tax law, how to detect fraud, and how to read and analyze financial statements. The program takes two semesters to complete. Because the four-course certificate sequence may be applied to master's studies, its admissions requirements are the same as the master's in accounting program. Applicants should have earned an undergraduate degree with a minimum cumulative GPA of 2.75. They must also submit GMAT scores and have two years of relevant work experience. Tuition is charged on a per-credit basis and is the same for in-state and out-of-state students. Tucson's University of Arizona provides a flexible graduate certificate in accounting online program. Students who have a foundational accounting background take three courses to earn the certificate. The program allows students to tailor their studies to their professional needs, while also serving as a foundation for CPA requirements in Arizona, California, and Texas. Courses cover topics such as advanced federal taxation, business law, and ethics for professional accountants. The certificate program has two start dates in the fall and two in the spring. Admissions decisions are made on a rolling basis. Applicants should have earned a bachelor's degree with a minimum cumulative GPA of 2.75. Because this is a certificate program, students are not eligible for federal financial aid. In-state and out-of-state students pay the same per-credit tuition rate. Penn State's online accounting graduate certificate is designed for students with an undergraduate background in accounting. The 12-credit, four-course sequence takes two semesters to complete and serves as a foundation for students who wish to pursue a CPA licensure. Required coursework focuses on auditing theory and practice, while elective coursework is available in topics such as management, decision making, financial statements, and tax planning theory. Students may enroll three times per year in the fall, spring, or summer semesters. All four courses in the certificate program can be applied to Penn State's online master of professional accounting degree. The program charges a flat tuition rate for all students based on the number of credits taken per semester. Applicants should submit undergraduate transcripts and, if applicable, proof of English proficiency. Penn State alumni do not need to submit transcripts. ULM's graduate certificate in accounting online program is designed for students who earned their undergraduate degree in a non-accounting discipline. The post-baccalaureate certification in accounting offers courses that are required to sit for the CPA examination in Louisiana. To earn the certificate, students must complete nine introductory credit hours that cover topics such as business law and managerial accounting. Through their studies, students also learn about auditing, income tax, international accounting, and cost accounting. Applicants must submit their official undergraduate transcripts along with GRE or GMAT scores. Successful applicants must have a minimum undergraduate GPA of 2.5 and a score of 283 on the GRE. Tuition is charged on a per-credit basis. In-state and out-of-state residents pay the same rate. Golden Gate's graduate certificate in accounting online program is ideal for working professionals who want to take their careers to the next level. The certificate in accounting is awarded to students who complete a 15-unit, five-course program. The curriculum covers accounting fundamentals and helps prepare California students who wish to sit for the CPA or CMA examinations. All courses are taught by professors with many years of work experience in the San Francisco Bay area. Because of the program's short duration, no transfer credits are accepted. Applicants must have earned an undergraduate degree and must submit college transcripts from all institutions attended. The program has accounting prerequisites that must be taken at Golden Gate. In addition, international students must demonstrate English proficiency. Tuition is charged on a per-class basis that is the same for in-state and out-of-state students. 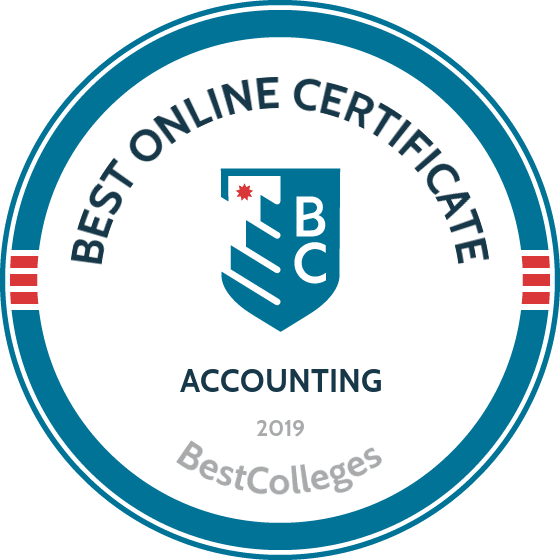 The Washington State Board of Accountancy recognizes City University of Seattle's online graduate certificate in accounting for its comprehensive CPA examination preparation. The 15-credit, five-course sequence is taught both synchronously and asynchronously and examines topics such as managerial accounting, individual and corporate taxes, and auditing. All instructors are current accounting professionals. Qualified students must have majored in accounting during their undergraduate or graduate studies. Applicants should submit undergraduate transcripts. As admissions decisions are made on a rolling basis, there are multiple enrollment dates throughout the year. International students should submit proof of English proficiency. Military students receive a tuition discount, and in-state and out-of-state students pay the same per-credit tuition rate. Located in Seattle, Saint Leo's online accounting graduate certificate prepares students to sit for the CPA examination in the states that do not require a master's degree in accounting. The 18-credit, six-course program examines topics such as accounting law, government and nonprofit accounting, fraud, and how to utilize financial accounting information. The certificate is offered entirely online in a format that is primarily asynchronous. Applicants must submit transcripts from all undergraduate institutions they have attended. They must also have a minimum undergraduate or graduate GPA of 3.0 and a minimum score of 500 on the GMAT. In-state and out-of-state students pay the same per-credit tuition rate, though active military students receive a sizeable discount. Located in Boston, Suffolk University's online graduate certificate in accounting develops in-depth knowledge of fundamental accounting principles that can be applied in the workplace or as advanced training for the CPA or CMA examinations. The 15-credit, five-course program consists of courses in cost and financial accounting, auditing and assurance, and federal taxation. The certificate can be completed part-time in nine to 12 months. Students who wish to enroll in a master's in accounting program at Suffolk are able to count the certificate toward their degrees. Admissions decisions are made on a rolling basis, though there are priority deadlines of March 15 for fall, October 15 for spring, and April 1 for summer. Applicants should submit official transcripts, a goal statement, a resume, and recommendation letters. Students also receive access to Wiley CPAexcel, which helps with examination preparations. National's graduate certificate in accountancy consists of six courses that total 27 quarter units. Unlike many other online graduate accounting certificate programs, National's certificate is available to students at both the graduate and undergraduate levels. Courses cover topics such as accounting information systems, cost accounting, and advanced managerial accounting. A distinctive feature of the program is that it offers a course in government and nonprofit accounting. The certificate helps students prepare for the CPA and CMA examinations. However, due to state requirements, the university encourages students to complete a bachelor's or master's in accounting in order to be fully prepared to take the exams. Admissions decisions are made on a rolling basis, and there are multiple start dates throughout the year. Applications are evaluated based on previous academic achievement, relevant work experience, and educational goals. SNHU's accounting graduate certificate online program gives students a well-rounded education in a number of fundamental accounting topics. Through a sequence of seven courses, students acquire knowledge of audits, cost behaviors and systems, financial and multinational accounting, reporting to the SEC, and federal income taxation. All courses are delivered asynchronously. Credits count toward the 150-credit hour requirement needed to sit for the CPA examination, and can also be transferred into the university's master's in accounting degree program. As there are multiple start dates throughout the year, admissions decisions are made on a rolling basis. Applicants must provide undergraduate transcripts with a minimum cumulative GPA of 2.75. In-state and out-of-state students pay the same per-credit tuition rate, but military students receive a 25% discount. The university is accredited by the New England Association of Schools and Colleges. Davenport is known for its Excellence System, an academic approach that emphasizes communication, teamwork, leadership, and public engagement. These principles inform its online graduate certificate in accounting. The 12-credit course sequence explores topics such as accounting research, information systems, ethics, and performance control. Davenport recommends that students take one course per semester to finish the program in two years, though the program can be completed in less time. One of the required courses is offered only in the fall semester, while another required course is offered only in winter. Applicants should submit official transcripts from all prior undergraduate institutions. In-state and out-of-state online graduate students pay the same per-credit tuition rate. Consisting of 13 courses made up of 48 credits, Brescia's online accounting graduate certificate delivers an unparalleled education. Many courses take students beyond introductory topics to teach them advanced skills in areas such as basic and managerial accounting. Courses are offered primarily asynchronously, though there is a weekly one-hour live chat required. For quicker completion of the certificate program, the university allows up to 30 credits to be transferred from another institution. Applicants should have earned a bachelor's degree with a minimum cumulative GPA of 2.5. There are no additional requirements to enroll. Start dates are available in the fall, spring, and summer semesters. Out-of-state residents pay the same per-credit tuition rate as their in-state counterparts. Because of the large credit load, federal financial aid is available for this program. Intermediate Accounting: Students learn basic practice and theory of financial accounting. Coursework covers accepted practices in the industry, accounting information systems, cash controls, receivables, and related problem-solving skills. Auditing: This course explores concepts and procedures involved in auditing financial statements. Students learn theories of audit evidence, legal responsibilities, professional and ethical standards, and audit planning, often examining these in the context of economic and political change. Federal Taxation: This course introduces students to income taxation and related compliance issues, liabilities, planning, and reporting. The course may focus on taxation for individuals, businesses, or both and prepares students for careers in tax preparation. Research and Communication: Students learn the types of research certified public accountants (CPAs) perform, how to use research databases, and basic communication practices, including proper use of grammar and punctuation. This class prepares students for specialized careers in accounting research management, which involves monitoring the quality of other accountants' work. Due to the depth and scope of post-baccalaureate accounting programs, graduates pursue a variety of career opportunities, including advancement and specialization. Some professionals pursue certification to boost salary potential. Professionals in accounting should be detail-oriented with good analytical, organizational, and communication skills. Below are three career paths for professionals with an online graduate accounting certificate. Accountants and auditors prepare and review financial records, ensure taxes are paid properly, and assess the financial operations of companies. They ensure all documents are accurate and compliant. Financial analysts assist individuals and businesses with investments. They assess investment types, economic and business trends, and other factors to evaluate the profitability of ventures. Experienced financial analysts may become portfolio or fund managers. Personal financial advisors provide guidance on investments, insurance, college savings, mortgages, taxes, and retirement — although some specialize in certain areas. Most complete a year of work under supervision before pursuing self-employment. Salaries vary by career path, geographic location, and experience level. The following table shows the average salaries of five of the most common accounting-related positions at different career stages. Before applying to a program, verify that the school is regionally or nationally accredited. Accreditation indicates that the online graduate accounting certificate program meets high standards of quality. Before awarding accreditation, accrediting agencies evaluate curriculum development, student achievement, and faculty, academic, financial, and support services. Accreditation is not mandatory for certification programs, but many employers and educational institutions only recognize credentials awarded by accredited schools. Regional accreditation is generally regarded as more prestigious than national accreditation. Online accounting graduate certificates may also earn specialized accreditation from accrediting bodies specific to accounting or business, such as the Association to Advance Collegiate Schools of Business, the Accreditation Council for Business Schools and Programs, and the International Assembly for Collegiate Business Education. Professional organizations help students and recent graduates maximize the value of their online accounting graduate certificate. Members network with accounting professionals from across the country to learn about the field, share ideas, and stay updated on business and accounting trends. Membership benefits often include networking opportunities, online job boards, career services, and continuing education programs. This full-service organization helps recent graduates with job searches and research projects. The organization welcomes students, and member services include résumé help and scholarship opportunities. This organization offers students access to renowned, cutting-edge online research journals, a career center, and a powerful network of thought leaders. This global organization comprises more than two million accountants worldwide. Membership with this internationally recognized federation, which contributes to establishing accounting standards, is a useful résumé builder. This networking group helps new CPAs and current students develop interpersonal skills and find jobs. Members receive up to 27 CPE credits per year to keep their license up to date. This honors organization emphasizes the ethics and practice of accounting. Beta Alpha Psi holds annual meetings and has more than 300 chapters with more than 300,000 members. Though a prestigious credential, an accounting certificate is significantly cheaper than a graduate degree. Still, many students need financial support to attend a graduate certificate accounting online program. Take advantage of employer sponsorships, private loans or scholarships, and federal funding, which may include scholarships, loans, grants, and work-study programs. Complete the Free Application for Federal Student Aid, or FAFSA, to determine your eligibility for federal funding.